Content upgrades are one of the newest marketing trends for collecting email subscribers, and they really work. We use them on this blog, and have seen a higher conversion rate with content upgrades than with other forms. In fact, they’ve increased our list size by 49.9%. We’ll get to our case study in a minute, along with a few other examples. It could also be an email opt-in form embedded in the post, or a popup, but the idea is the same. Create a valuable piece of extra content that is related to your article, and offer it in exchange for an email address. The idea is to find your highest trafficked posts, and add content upgrades to these posts. This is a better way of building your email list than simply saying “sign up for my newsletter,” because you are providing what your visitor wants right that second. The more time you spend on the content upgrade, the more subscribers you will get. If you just create a PDF of a 1000 word blog post, it probably won’t get many conversions. 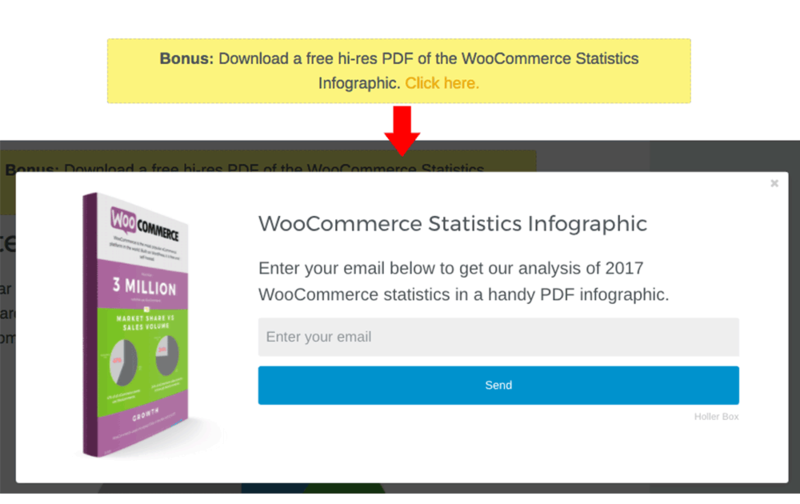 On the other hand, if you create an incredibly useful PDF ebook that is exactly what your visitors are looking for, it’s possible to see opt-in rates over 20%. Let’s look at some examples of successful content upgrades that are seeing high conversion rates. 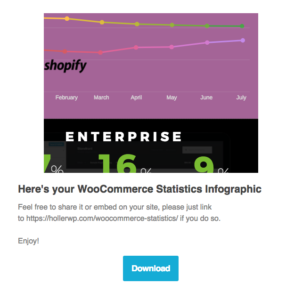 On this blog, we have a popular post about scaling WooCommerce. 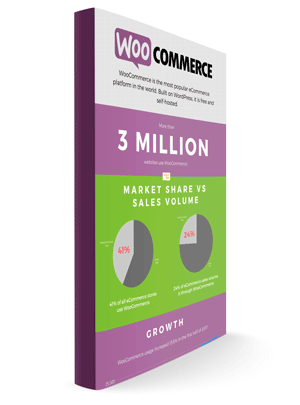 Download a free infographic of 2017 WooCommerce statistics to see how it compares at scale in the enterprise. Click here. 1/3 of our email list subscribes through this content upgrade. That’s huge! Even with all the other email forms and popups on this site, it’s the best converting lead generation form we have. If we put that in terms of a percentage increase, it is staggering. Our list is 49.9% larger because of one content upgrade. I didn’t even realize until I was writing this post how significant it has been. It’s the same content upgrade, with different wording. The upgrade performs much better on the scaling post, because it provides bonus content not contained in the post. Content upgrades convert better if they contain valuable bonus content that’s not already in the article. Seems obvious, but many articles about content upgrades suggest you just provide a PDF version of the article itself. If you offer a content upgrade that just summarizes what the article is about, or provides an infographic they’ve already seen, it won’t work as well. It makes sense, people are more willing to give up their email for something that they can’t get elsewhere. However, there are no hard and fast rules to this, as shown by the examples below. Here’s a content upgrade…get a free spreadsheet with 21 more ideas and examples, an ebook cover design, and a 3D Photoshop action, free! Click here to get your bonuses. Sumo used a spreadsheet for a content upgrade, and saw a measly 4% conversion rate. 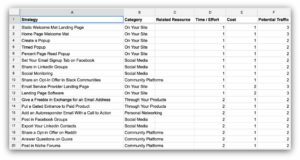 [The upgrade was] A spreadsheet that contains 355+ power words you can use in your copy to increase conversions. The spreadsheets are insanely useful, but people don’t want to give up their email address for a list of words. Even though this spreadsheet didn’t work, they had other spreadsheets that performed much better. This one on email list building ideas had an 11.2% conversion rate. The lesson here is that it’s about the message, not the medium. It doesn’t matter if it’s a spreadsheet, a PDF, or other media, it’s the value of the content to your reader. If you don’t have valuable content, you will have a poor conversion rate. In a different post, the team at Sumo used an ebook for a content upgrade that did much better. 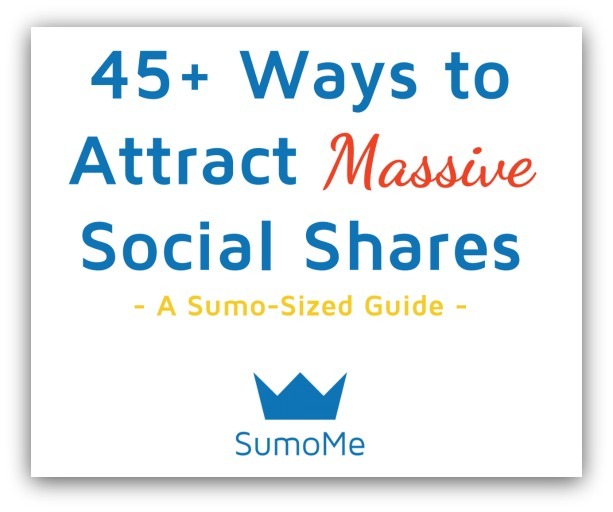 They created a massive 12,000 word guide to social sharing, then created a PDF ebook of the article. Using the ebook as a content upgrade had a 21.2% conversion rate. Their hypothesis was that people were too lazy to read the huge article in one sitting, so they’d rather download the ebook and read it later. They were right! Most of the time just creating a PDF version of your articles won’t convert well. It worked for the Sumo team because their article was so long, and it provided clear value. After struggling to find a way to get higher conversions, the Backlinko blog saw a 785% increase in conversions by adding a checklist as a content upgrade. Backlinko’s results were similar to ours, in that 30% of his subscribers come through his content upgrades, even with multiple opt-in forms on every other page of his site. If we put that in terms of percentage difference, his list is 42.8% larger than it would have been without content upgrades. Amazing! 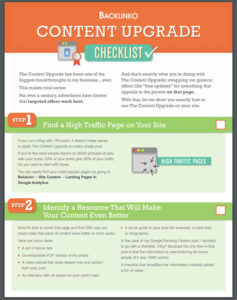 Now that you are convinced (hopefully) that you should use them, let’s look at how to create your content upgrades. Creating content upgrades is a lot of work, that’s why most people don’t use them. However, it’s worth the effort. The first thing you want to do is identify your highest trafficked articles. 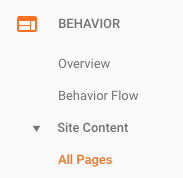 You can do that in Google Analytics under Behavior => Site Content. Make sure to set your timeline to the last 30 days (or more). 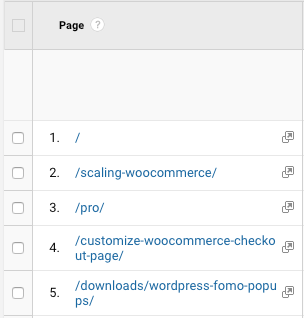 You should see your best performing pages in order, scroll through until you find a blog post. Really simple content upgrade idea: if you just need something to get started, create a PDF of your blog post and a nice graphic using Canva. It’s really easy, you can always get more complex later. The goal is to create something that people will salivate over, put some time and effort into making it full of great content they can’t get anywhere else. Upload the content to your site, Google Drive, or wherever. The next step is to add the link and email form. We use Holler Box Pro to handle the content upgrade, but you can also use a normal email form. With Holler Box Pro, you can choose popup as the type, enter your email provider details, and select content upgrade to get a shortcode that will show the upgrade. Adding that shortcode to a post or page adds a box like you see below, and clicking the link shows a popup with a subscription form. You can also just embed a normal email form if you don’t want to pay for a plugin to do it. The important part is setting up your email provider to send the content in an email after the user signs up. 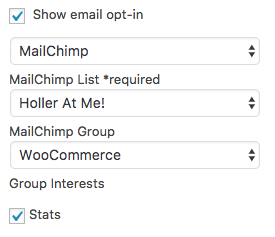 To get MailChimp to send an email with your content upgrade after a subscriber signs up, you can create a new list, or use groups. The easiest way to do this is to create a new list, but you probably don’t want to do that. It’s a pain to have multiple lists for the same site in MailChimp. 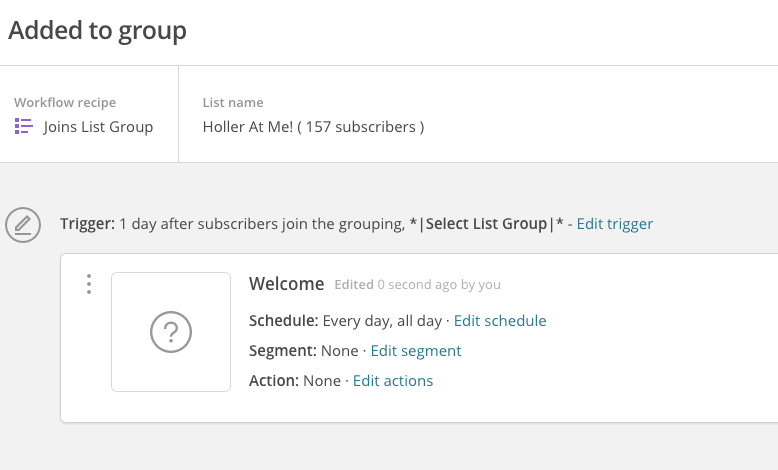 If you want to keep everything in one list, you can use groups. 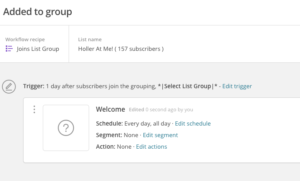 To do that, go to your list, click on Manage Contacts => Groups => Create Group. You will need to create a sub group (called interests), in my case I have WooCommerce => Stats. After that, you need to setup an automation. Go to Campaigns => New Campaign => Email => Automated. The automated part is a little weird, see the image below. Click “edit trigger,” choose to send “immediately” and select your group, then save. Next, design your email with a link to your content upgrade. Save that, and go through the final steps to confirm and start your automation. Now you just need to add a form to your site that signs people up to that specific group and interest. 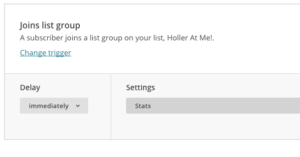 If you are using Holler Box Pro, you can select your group and interest on the box setup screen. 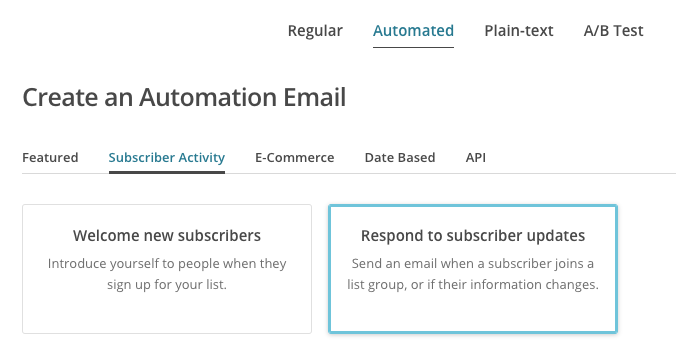 This will automatically add subscribers to your MailChimp group, and send them your content upgrade. If you are not using a lead generation plugin, you can just embed the form on your site. You can use the form under Lists => My List => Signup Forms, but you’ll need to edit the HTML. There is an article on how to do this here, basically you pre-select the interest checkbox and optionally hide it. Other email services make this step easier, so we won’t cover those here. Usually you can just create a segment or tag that sends an autoresponder, which we covered in detail on our article about segmenting your email list. I can’t write an article about content upgrades without a content upgrade, so here’s a bonus for you! It’s clear that content upgrades work really well, I want to help you create your first one. Get the content upgrade spreadsheet, ebook design, and Photoshop action bonus materials => Click here.